Ultra Sword in Super Smash Bros. for Wii U.
Ultra Sword (ウルトラソード, Ultra Sword) is Kirby's Final Smash in Super Smash Bros. 4 and Super Smash Bros. Ultimate. Kirby dons a green cap and wields a giant sword. He then swings the sword, trapping nearby opponents, and slashes the character multiple times. After slicing the opponent multiple times, the sword grows bigger, and Kirby finishes with a powerful blow, which sends the targets flying at a fair distance. The Final Smash deals a total of 40% damage. Ultra Sword is a Super Ability from Kirby's Return to Dream Land. Super Abilities are obtained by copying "Super" versions of enemies and expire upon finishing the level or running out the ability's time limit. Ultra Sword specifically involves Kirby swinging a huge sword in front of him to deal enormous damage to any enemies within range, though it can also randomly appear as a meat cleaver, a wooden training sword, a fan, Meta Knight's sword, or a large blue fish. Like all Super Abilities, it destroys terrain marked with star emblems and allows access to alternate dimensions where Sphere Doomers are found. Ultra Sword also appears in two boss battles, where it must be used to break the boss's shield and subsequently land the final hit; in these instances, the sword also grows larger just before the final strike. However, the actual attack is executed differently, with Kirby striking with three different swords along with the standard Ultra Sword, for a total of five hits. For Kirby's Final Smash, he swings a sword that's waaay bigger than he is. If the first swing hits, he'll keep going with a combo of lightning-fast slices, dealing tons of damage. For the last swing, the sword grows even larger and launches any victims. Make sure that the first swings hits, though, or nothing else will happen! For Kirby's Final Smash, he swings around a sword that's waaay bigger than he is. If the first swing hits, he'll keep going with a combo of lightning-fast slices, dealing tons of damage. For the last swing, the sword grows even larger and launches its target. It's great, so make sure that first swing hits, or none of the rest will happen! Inhaling Shulk and activating any of the Monado Arts allows Kirby to pass on its effects to Ultra Sword: Buster deals 50% and lower knockback than the standard Final Smash, while Smash deals 20% and higher knockback. This makes Ultra Sword the only Final Smash to be affected by a copy ability. As is the case with Shulk, this must be done by selecting the Monado Art prior to obtaining the Smash Ball, as at that point pressing the special move button will activate the Final Smash instead. In the Super Smash Bros. 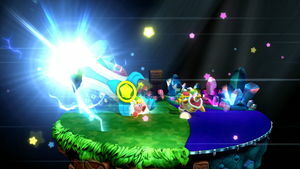 Direct, Ultra Sword was shown to have a paralyzing effect; in the final game, however, opponents just spin in a circle. Unlike other trapping multi-hit Final Smashes, each hit from Ultra Sword will cause a "Deadly Blow" red spark effect if the opponent is at an extremely high percentage (eg. 999%). This page was last edited on March 5, 2019, at 21:51.